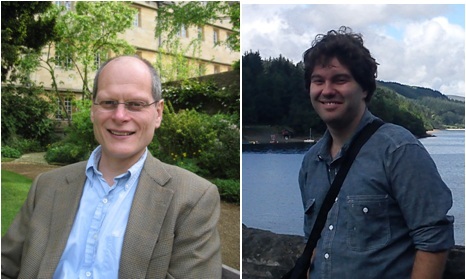 Ian Walmsley (left), Joshua Nunn (right) contempl -ating the universe. More than 70 years ago, Erwin Schrödinger pointed out one (of many) striking features of the quantum mechanics that he’d recently invented: the possibility it allowed for stuff to do things that no one had actually seen in real life -- like cats being both dead and alive at the same time. This is one of what could be politely called the ‘interpretational difficulties’ of quantum physics. Familiar everyday objects behave in familiar everyday ways - they don’t engage in the sorts of nonsensical behaviour that Schrödinger’s equation predicts. But, as any physicist will tell you, basically quantum mechanics is not that complicated. It’s just that it takes familiar concepts, like position and direction, and makes us think about it in totally radical ways, so that in the end the results don’t make any sense at all! August 07, 2011: "Building a Quantum Internet"
Michael Sprague (top), KC Lee (left) and XianMin Jin (right), in the lab with the diamonds. Of course, in the early 20th century, people were used to the idea that science was coming up with crazy new notions that dramatically altered our conception of things — like the notion of time in Einstein’s special theory of relativity. But Einstein’s theories deal with objects that can be seen on size and timescales that are familiar. The light from stars can be observed with a simple telescope; the timing of GPS satellites is a tangible technical problem. For this reason relativity has entered the scientific orthodoxy, which is why the recent neutrino speeding anomaly has caused such stir . That’s what worried Schrödinger. In principle his theory also dealt with tangible objects — or at least there was no element in it that indicated otherwise. Yet it seemed at first as if quantum mechanics only gave good predictions for objects that are too small to be seen directly. It therefore took on the flavour of a story, in which the actors — electrons, atoms and photons — are convenient fictions we can use to explain what we see, but which are no more real than the characters in a novel. Quantum theory tells us that in fact these characters can be in two places at once, that they are impossible to pin down exactly, and that they don’t really therefore give well defined answers to questions like ”are you red or blue”? We’re used to the idea in the ordinary world that an object, say a ball, will have a definite property like color. We may not know if a specific ball is red or blue, but we may regard it as having one of these two colors independent of whether we know which particular color it is. Quantum mechanics says, well, no, it’s not possible to be sure of that. In the quantum world, balls can be both red and blue at the same time. But it is not the particles acting on their own that give rise to the deepest mysteries — it is when they get together that the fun really starts. For instance, it becomes possible to say that the color of one ball is well defined only in relation to a second ball. So if one is red, then the other is certainly blue -- but that neither is definite red or blue on its own. And you can actually test this proposition with microscopic particles — like photons (“particles” of light). This is the murky world of ”entanglement” in which pairs of particles are apparently connected across the universe as if by invisible filaments. You can think about this in terms of what you know about light. Consider a beamsplitter. This is a common optical device: essentially a half-silvered mirror which passes half the incident light, and reflects the other half, as shown in Fig. 1. When a single photon encounters a beamsplitter it cannot split itself in two, so it must go one way or the other. Or does it? According to quantum physics it can go both one way and the other. In fact, the beamsplitter transforms the single photon into an entangled state. If we measure if the photon is passed or reflected, we get that each option occurs 50% of the time. So this measurement alone does not help us distinguish between the entangled state and a state in which the input photon definitely goes one way or the other at random. But consider the time reversal of this situation. Now we put a single photon into the back side of the beamsplitter. It also could be reflected or passed with 50% probability, except if the photon is in an entangled state of the two input ports. Then, by reversing argument above, we can see that it is definitely passed through the beamsplitter. Thus, by looking at how often a single input photon is passed by the beamsplitter, we can tell whether or not it was in an entangled state at the input. This kind of magic realism makes physicists (or at least, philosophers of physics) uncomfortable, but the edifice of science survives with such strangeness at its core because quantum effects are confined to the abstract domain of the microscopic, where human experience has no purchase and there can be no direct conflict with our intuitions. Figure 1: A single photon (filled circle) cannot divide into two when it hits a beam splitter. It must either pass through, or be reflected. According to quantum mechanics, both of these possibilities occur, producing an entangled state, in which a single photon is shared between the two beams after the beam splitter. Running this process in reverse (i.e. 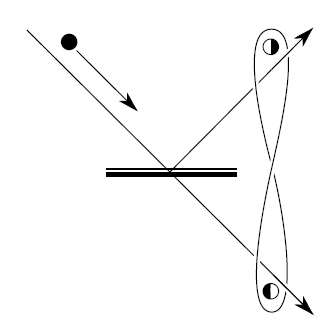 from right to left) provides a way to detect entanglement, since only an entangled state will always produce a single photon in the same place on the left. There is now a strong tradition of research which seeks to bring us face-to-face with our Frankenstein theory by confirming the predictions of quantum mechanics on human scales. The aim is to demonstrate quantum effects such as entanglement with increasingly large objects, containing more and more particles. Although many areas of physics have matured sufficiently that the underlying components of the theory are ‘accepted’, it is known that quantum mechanics as is cannot be the final word, since its predictions conflict with our experience of the world. Either some new physics is needed, or better arguments to explain how to reconcile quantum theory with the rest of the world. While the philosophical debates smoulder on [3,4], experimentalists have set themselves the task of identifying the conditions under which quantum effects survive into the human realm, leading to behaviour we are not used to seeing in the familiar world of cats and elephants. Considerable progress has been made: large numbers of atoms have been entangled [5,6], and small pieces of solid material — but big enough to see with the naked eye — have been put into quantum superposition states where they were both vibrating and not vibrating at the same time . These breakthroughs showed that quantum effects don’t need to be confined to small numbers of particles, or to particles without mass like photons. But so far, extremely specialised laboratory conditions have been required to observe these effects: very low temperatures just above absolute zero and high vacuum, with no air and no extraneous electric or magnetic fields. The objects were highly delicate composite devices which would not be found in nature, and careful preparation was required in order to keep them isolated from the deleterious effects of the environment. We recognised that some materials have properties, like vibrations, that naturally lend themselves to realising these conditions in an everyday laboratory setting. These vibrations require a lot of energy to get going, so that ordinary environments at regular temperatures do not excite them. They are by nature in relatively pure quantum states, with no vibrational excitation at all. They may, however, be strongly coupled to their environment in the sense that once excited they quickly decay, so that quantum effects might be present only if we could be quick enough to observe them before they became overwhelmed. We therefore decided to carry out an ‘easy experiment’ (though only Oxford physicists could be silly enough to think that any experiment is easy); to set one of these vibrations going using a very short duration light pulse from a laser, then to ”watch” it by means of a second short laser pulse acting as a probe of the vibrational motion. We realised that diamond was a naturally-occurring transparent material that was so hard that it could vibrate at a particular, very high-pitched frequency, which could be easily identified in a measurement. 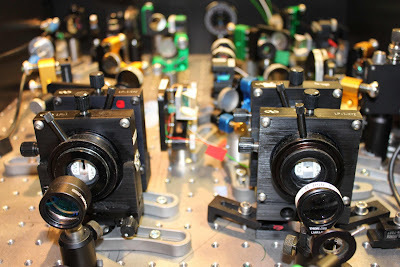 The vibrations in diamond last for just 7 picoseconds (1 ps is one thousandth of a nanosecond), so we had to use an ultrafast laser system producing laser pulses shorter than 100 femtoseconds (1 fs is one thousandth of a picosecond!). a laser pulse. When the laser pulse hits the diamond, there is a small probability that just one photon from the laser pulse gives up some energy to the diamond to set it vibrating. By conservation of energy, this must mean that the photon leaves the diamond with reduced energy, and thus a longer wavelength than the original laser photon. By detecting this “red” photon, we could know that a single vibrational quantum (known technically as an optical phonon) had been created in the diamond crystal. We found that even at room temperature and pressure, in a lab with air and other vibrations and cups of tea, we could create this high-frequency vibration. Now, we could prove this by detecting it using a second laser pulse, arriving after the first, but not so long after that the vibration had decayed away. The probe pulse detected the vibration by picking up energy from it, emerging with a shorter wavelength, so blue-shifted in color. So we detected a “red” photon to signal that a phonon has been generated, and a “blue” photon to prove that. Using this approach, we showed that we could catch a glimpse of the phonon before it vanished . This type of “create-detect” experiment is precisely what has been done with cold clouds of atoms to entangle them, so we thought we would try to do that! Figure 2: The happy couple. We took data with the lights off but otherwise the diamonds were in a totally ordinary environment. The lenses are there to focus the laser pulses and collect the photons emitted by the crystals. In a second experiment , we set up two diamonds, in ordinary little holders sitting near each other on a lab table (see Fig.2). By hitting both diamonds with a laser pulse at the same time, we created a vibration in one of the crystals, but it was impossible, even in principle, to tell which crystal was vibrating. We did this by combining the beams from the two diamonds that went to the “red” photon detector on a beamsplitter, as shown in Fig.3. When this detector fired, we knew that a single phonon has been generated, but we could not tell from which beam the red photon had arrived, and therefore in which diamond the phonon resided. Quantum mechanics predicts that, if you don’t know this information, the right way to describe the diamonds is as an entangled quantum state, with one vibration shared between them. We then verified that the diamonds were entangled by combining the “blue” light from the diamonds at a beamsplitter (see Fig.3). We could detect first that each pulse only contained a single “blue” photon, and second that it was always passed by the beamsplitter, rather than reflected. This is only possible for a single photon if it is entering the beamsplitter in an entangled state, as argued previously, and thus was emitted from both diamonds! This means that the diamonds themselves were entangled, with a single vibration shared between both of them. These results show, for the first time, that large, easily visible, solid objects (indeed, diamonds are naturally occurring minerals: pieces of rock), sitting in ambient conditions at room temperature and pressure, clamped to a table-top, can be put in a quantum-entangled state. Furthermore, the entanglement was created with vibrations — the motion of the crystals as a whole. Figure 3: Generating and detecting entanglement between diamonds using ultrashort laser pulses (green lines). 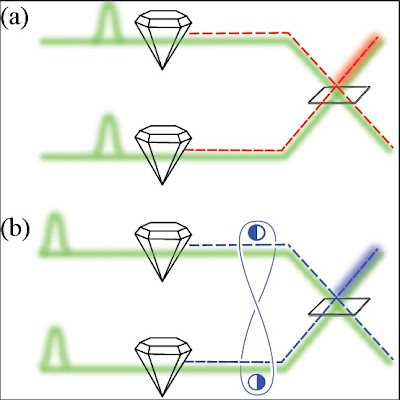 (a) The first set of pulses produces a single red-shifted photon from one of the diamonds. After the beams are mixed on a beam splitter, it is impossible to tell which diamond the photon came from. This means there is one vibration shared between the two diamonds — they are entangled. (b) After a small delay, we verify the entanglement by sending in a second pair of pulses, producing a blue-shifted photon in an entangled state. When this entangled state hits the beam splitter, the blue photon always emerges from just one side of the experiment (thick blue line). As shown in Fig.1, this can only happen if the diamonds are entangled. So the positions of the atoms were entangled. This is particularly unsettling because we have an intuitive sense for position that we would not have if we had entangled magnetic fields or photons. Our measurements are, we feel, one of the most visceral demonstrations to date that the rules of quantum mechanics apply to us all: electrons and elephants alike. Opera Collaboraton, "Measurement of the neutrino velocity with the opera detector in the CNGS beam". arXiv:1109.4897 (2011). Link. S.J. van Enk. "Single-particle entanglement". Physical Review A, 72(6):064306 (2005). Abstract. D. Wallace. "Decoherence and Ontology: or, How I Learned to Stop Worrying and Love FAPP", in "Many Worlds? Everett, Quantum Theory, and Reality", eds. S. Saunders, J. Barrett, A. Kent and D. Wallace (OUP, 2010). Link. R. Penrose. "Wavefunction collapse as a real gravitational effect". Mathematical Physics 2000 (edited by A Fokas, A Grigoryan, T Kibble, B Zegarlinski), pages 266–282, (World Scientific eBooks, 2000). Link. K. S. Choi, H. Deng, J. Laurat, and H. J. Kimble. "Mapping photonic entanglement into and out of a quantum memory". Nature, 452:67–71 (2008). Abstract. H. Krauter, C.A. Muschik, K. Jensen, W. Wasilewski, J.M. Petersen, J.I. Cirac, and E.S. Polzik. "Entanglement generated by dissipation and steady state entanglement of two macroscopic objects". Physical Review Letters, 107(8):80503 (2011). Abstract. Adrian Cho. Faintest thrum heralds quantum machines. Science, 327(5965):516–518 (2010). Abstract. K. C. Lee, B. J. Sussman, M. R. Sprague, P. Michelberger, K. F. Reim, J. Nunn, N. K. Langford, P. J. Bustard, D. Jaksch, and I. A. Walmsley. "Macroscopic nonclassical states and terahertz quantum processing in room- temperature diamond", Nature Photonics, 6, 41-44 (2011). Abstract. KC Lee, MR Sprague, BJ Sussman, J. Nunn, NK Langford, X.M. Jin, T. Champion, P. Michelberger, KF Reim, D. England, D. Jaksch, I. A. Walmsley. "Entangling macroscopic diamonds at room temperature". Science, 334(6060):1253–1256 (2011). Abstract.